Move the swing arm out of the way easily to prevent interference will you work. No longer comes with a table bracket. The bracket is now built onto the tables. The F921 adjustable arm can be mounted on the F975000 Edemco Hydraulic table, the F976000 Edemco Electric table only, all F975 tables and all F976 tables. Mounts to the Frame not the Table Top! Adjust up to 48" and is collapsible. Fits tables made in year 2005 or after. 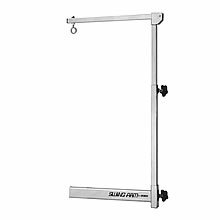 This grooming arm does not include table bracket. The pet cannot move the arm by the noose so it is always secure in the position you set it. Keep in mind that the overhead noose ring stays in the same position regardless of where the upright arm post is moved. NOTE: The Edemco Rotating Swing Arm (ED-F921) is not available for 48 inch table tops. If you do not already have the under table mount bracket you will need to purchase it.